While the season for West Nile virus (WNV) has been mild compared to previous years, the Oklahoma State Department of Health (OSDH) encourages residents to take precautions to reduce the risk of contracting WNV, a mosquito-borne illness. So far in 2018, the OSDH reports there are seven confirmed cases of WNV disease with one case leading to a death. Five cases have occurred among Oklahomans older than 50 years of age. Most cases have been reported during the months of August and September. Although relatively mild temperatures and heavy rainfall have contributed to a milder WNV season, health officials are reminding the public that mosquitoes often spread the virus through October and it is important to take precautions to prevent getting bitten by an infected mosquito. WNV is spread through the bite of the Culex mosquito, which feeds on infected birds and transmits the virus when biting humans, horses and some other mammals.This type of mosquito increases in numbers during mid to late summer when the temperatures climb and the weather pattern is dry. • Use an insect repellent containing DEET, picaridin, or IR3535 on exposed skin and clothing when going outdoors, particularly between dusk and dawn when mosquitoes are more likely to bite. Insect repellent with permethrin should be used on clothing only. Always follow instructions when applying repellent. • Avoid spraying repellent on a child’s hands, eyes, mouth or irritated skin. Adults should apply repellent to their hands and then apply to a child’s face. 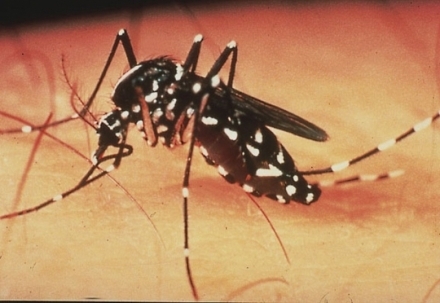 Products containing DEET may be used on children older than 2 months of age. • Protect infants by putting a mosquito net over infant carriers and strollers. • Avoid outdoor activities when Culex mosquitoes are most active in the early morning and early evening. • When weather permits, wear long sleeves, long pants, and socks when outdoors. • Repair or install window and door screens to keep mosquitoes out of the home. • Prevent items such as buckets, cans, pool covers, flower pots, children’s toys and tires from holding water so mosquitoes don’t have a place to breed. • Repair any leaking faucets or irrigation systems. Symptoms of WNV vary widely depending on a person’s risk for more severe disease that involves the central nervous system. Some may experience sudden onset of fever, headache, dizziness, and muscle weakness and recover within one to three weeks while others develop life-threatening meningitis or encephalitis causing confusion, stupor, paralysis or a coma. Long-lasting complications of WNV disease can include difficulty concentrating, migraine headaches, extreme muscle weakness and tremors, and paralysis of a limb. Those older than the age of 50, diabetics, or those suffering from uncontrolled hypertension are at greater risk of developing severe neurologic disease from WNV. There is no vaccine or treatment drug for the illness, so taking steps to avoid mosquito bites is the only defense.